Cardiff City manager Malky Mackay claims his team should have been awarded a penalty during their 2-0 home defeat against Brighton on Tuesday. Craig Bellamy was brought down in the second half with Cardiff trailing 1-0, but ref Keith Stroud gave a free kick. 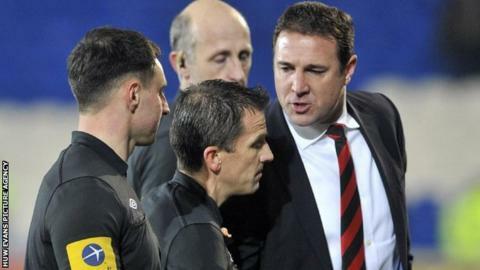 "I've spoken to Keith about it, he's got it wrong," said Mackay. "Craig was on the line when the foul happened... [by] the letter of the law, the fourth official tells me that's a penalty." Mackay claimed the referee told him the foul was outside the box. The defeat ended a nine match unbeaten run which had seen the Bluebirds open an 11 point lead at the top of the division in late January. That gap was reduced to five points as former Swansea City midfielder Andrea Orlandi and Leonardo Ulloa scored late in each half to seal the victory. But Cardiff still have an eight point cushion over Watford in the automatic play-off positions. It was a 41st birthday to forget for Mackay, who said his team created "enough chances to win three games" as they slipped to only their second home Championship defeat of the season. Cardiff fired 22 shots on target, but failed to beat Tomasz Kuszczak in the Brighton goal, the Polish goalkeeper pulling off a string of superb saves. "It looked as though it would be one of those nights and that's how it turned out to be," said MacKay. "We had enough chances to win three games." "We had 22 attempts on target which is quite incredible playing against a good team. "[Brighton] are a team who usually keep the ball off teams and pass it really well and I thought we didn't allow them to settle." And Mackay is calling on his team to maintain their concentration in the race for promotion to the Premier League. "It's our second defeat in 18 games," said the Scotsman. "Had we not played well and been beaten I'd have been annoyed, but we played well. "We have to just stay focussed and calm because they are a very good group of players and a group that have done very well this season and will keep doing well."